State Champions were crowned, the world raced bikes out of Kings Dominion and through Hanover Courthouse, more football memories were made, and the boys of summer reached new heights. From 25-game winning streaks to changing of the guards at Atlee and Randolph-Macon, it's been a topsy-turvy unforgettable 2015 in Hanover County sports. So, what did we choose as the top five stories of the year? Which headlines made honorable mention? Find out by reading our special Year In Review from the pages of The Herald Progress by CLICKING HERE! Happy New Year from RVA Sports Network! We can't wait for sports in Hanover County in 2016! Six county teams are in action between Christmas and New Year's, with both Lee-Davis and Hanover hosting tournaments on Tuesday and Wednesday! For schedules, brackets, ticket information and more, go to our main network website by clicking HERE. For highlights from Christmas Week action with Atlee basketball and previews of the upcoming tournaments, download the latest edition of the "Central Region NOW!" Podcast at the top of this page! RVA Sports Network is proud to announce today confirmation of our first-ever high school swimming broadcast, providing live online radio coverage of the inaugural Hanover Hawk Invitational Swimming Championship on Saturday, December 19th. 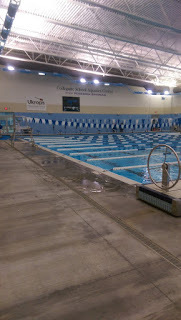 The meet, which will bring in VHSL-sanctioned teams from across the Commonwealth from as far away as Winchester, Charlottesville and Williamsburg, will be an all-day event at the Collegiate School Aquatic Center in Chesterfield, home of SwimRVA. RVA Sports Network will offer live coverage of the championship heats in the evening. Qualifying heats will take place that morning. The Hawk Invitational is designed to bring a top-notch regular season meet to the Richmond area to rival that of the Kecoughtan Invitational, which has been one of the most popular in-season meets on the calendar for more than two decades. Here are the results of Friday night's Patrick Henry swimming victory over Colonial Heights. A despondent Hanover Hawks football team, leaving the field down 22-3 at the half Friday night to unbeaten Lake Taylor in Norfolk, returned to the field adjusted, desperate, and opportunistic, gaining 218 of their 273 yards of total offense, scoring 19 points and recovering two onside kicks. But two huge plays from scrimmage kept Lake Taylor ahead in the second half for a 37-22 victory to end the Hawks' season at 9-4. Clayton Cheatham ran for 99 yards and two one-yard second half touchdowns, while Marcus Bazala added 65 yards rushing and two two-point conversion completions, one to Kirkland Shaffner, the other on a leaping catch by Jakob Schneider. Hanover is now 13-10 all-time in postseason play, 2015 being the tenth consecutive year the Hawks made the playoffs, a remarkable accomplishment for a program in just its 13th year of existence. CLICK HERE to listen live as the Hanover Hawks battle defending 4A state champion Lake Taylor tonight in the 4A State Quarterfinals exclusively on WHAN Radio, 102.9 FM, 1430 AM, and online from The RVA Sports Network! For directions to Lake Taylor, click here! Last year, the Hanover High School swim team stepped it up by winning the 4A Conference Champs for both girls and boys. A significant achievement for a team that had not even won a single meet the previous two seasons. This year, Hanover High School is once again stepping it up by hosting a statewide invitational swim meet. On Saturday, December 19th, Hanover High School swim team will welcome eighteen swim teams to the first Hawk Holiday High School Invitational Swim Meet. The meet is the first ever of its kind in the Richmond area and will be held at the Collegiate School Aquatic Center, located at SwimRVA, in Chesterfield. 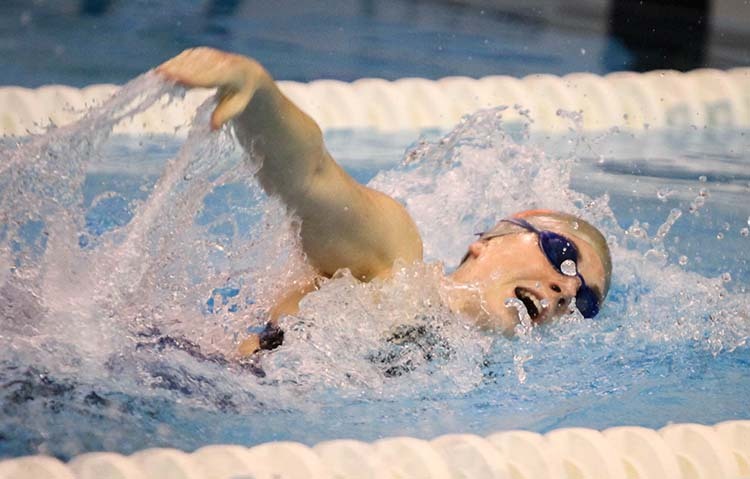 Eighteen teams from all over the state of Virginia will beattending the championship-style swim meet that provides preliminary action in the morning, with the fastest 16 swimmers in each event returning for finals that night. Local high school teams committed to the meet include Atlee, Colonial Heights, Goochland, Hanover, Lee-Davis, Maggie Walker, New Kent, Patrick Henry, Benedictine, and St Gertrude. Teams from as far away as Blacksburg (Blacksburg HS) and Winchester (John Handley HS) are attending. Additional teams attending including Bishop Sullivan, Bruton, Greenbriar Christian Academy, Hampton Roads Academy, Jamestown, King George, and Western Albemarle. The idea for the swim meet was the result of conversations Coach Massey had with other area coaches such as Karen Seeber (Atlee), Stuart Bernstein (Lee-Davis) and Bob Flanagan (Patrick Henry). Seeber believes the meet is a great addition to the schedule and high school swimming in the area. The meet is open for the general public. The cost of admission is $10.00 for the morning preliminaries and $5.00 at night. As part of the effort to host this swim invitational, the Hanover High School swim team is looking for financial sponsors and food/drink donations. All funds and donations will go first to support the Hawk Invitational and then to the Hanover High swim teams. Marcus Bazala, called upon again to lead the Hanover offense in the absence of Clayton Cheatham, rushed 35 times for 196 yards and a touchdown, passing for 99 yards and a score, while the Hanover defense held a high-powered Dinwiddie offense to just three points in the first 39 minutes, then registered two huge stops at the one-yard line to run critical time off the clock, stopping the Generals' comeback to hold on for a 23-17 win Friday in the 4A East Region Second Round at Hanover High School. The Hawks (9-3), held Dinwiddie to 99 first half yards, and led 23-3 with 8:49 left, but the Generals scored back-to-back touchdowns to cut the lead to six. On the second drive, though, after a Bryce Witt completion to Tye Freeland at the Hanover one, the Hawks stopped two Dinwiddie rushing plays, forcing a minute to go off the clock. Dinwiddie finally scored on a one-yard pass, but with 1:38 to go. Hanover recovered an onside kick and, with the Generals out of timeouts, Hanover didn't need a first down, and ran out the clock. Hanover next travels to Lake Taylor next weekend in a 4A State Quarterfinal, date and time to be determined. Meanwhile, a courageous Lee-Davis effort fell just short as the Confederates put a scare into 5A South top seed Highland Springs before falling 41-34 at Kreiter Stadium. Lee-Davis, who lost to Highland Springs 42-0 six weeks earlier, stayed score for score most of the night with the Springers. Lee-Davis ends their renaissance season at 9-3. Atlee, too, saw its season end as Tuscarora shut down the Raiders offense in the second half, turning a 21-20 halftime deficit into a 42-27 victory in 5A North Region second round play. The Raiders finish their season with a 7-5 record. NOTE: We will broadcast the Hanover/Lake Taylor game on The Game of The Week on WHAN Radio and online with RVA Sports Network, date and time to be determined. --Listen LIVE on 102.9 FM, WHAN Radio or online by CLICKING HERE! 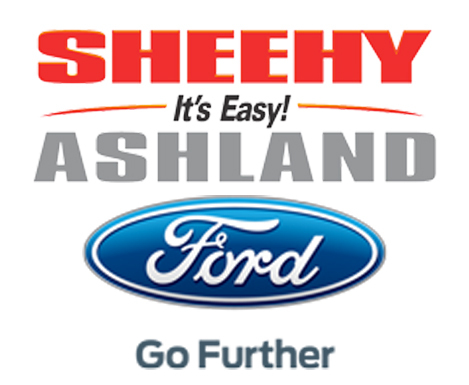 --The On The Sidelines Pre-Game Show powered by Sheehy Ford of Ashland begins at 7pm with Rob Witham and Marc Davis of NBC12! --Tickets are $8, available at the gate. --Hanover quarterback Clayton Cheatham, ejected for two unsportsmanlike penalties in last week's win over Louisa, will serve a one-game suspension tonight. Conference 20 Offensive Player of The Year Marcus Bazala will be under center. --Lee-Davis trying to avenge a 42-0 loss at the hands of the Springers on October 16th. --DIRECTIONS to Tuscarora are available HERE. --Raiders on four-game winning streak, Tuscarora is defending 5A North Region Champion. HANOVER (vs. Dinwiddie, 7:30pm): Advance tickets on sale Friday during lunches (11:50am--1:45pm). Tickets are $8. LEE-DAVIS (at Highland Springs, 7pm): Advance tickets on sale Friday during lunches (12pm--2pm) in Commons. On-site ticket sales at Highland Springs begin at 5:45pm. Tickets are $8. ATLEE (at Tuscarora in Leesburg, VA, 7pm): No advance ticket sales Friday. Tickets are $8, available at the event. For directions to the stadium, CLICK HERE. Randolph-Macon football's defense delivered their best performance of the season, holding off Hampden-Sydney time after time and scoring the eventual game-winning touchdown on a pick six from freshman J.J. Hill in the first quarter, as the Yellow Jackets ended a disappointing 2015 season with a third straight victory, 14-9 over the Tigers in the 121st edition of The Game. The Yellow Jackets end 2015 with a 4-6 record, their first losing season since 2006, and while they lose 26 seniors, including tailback John Byrd, who finished with 2,317 career rushing yards, they will return a core on both sides of the ball, including a host of now rising sophomores on offense baptized by fire this season. Meanwhile, in New Jersey, Yellow Jacket volleyball avenges a five-set loss to fifth-ranked Christopher Newport September 26th with a five-set win Saturday in the NCAA Division III Tournament Second Round. ODAC Player of The Year Courtney Lowers had 25 kills and 25 digs as the Yellow Jackets won the tiebreaker 15-13 to advance to third round play Sunday at 2pm against host Stockton University. 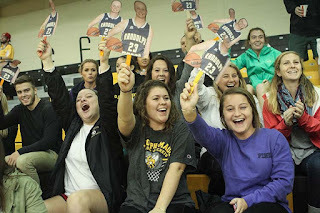 Randolph-Macon is now in the final sixteen of the national tournament. 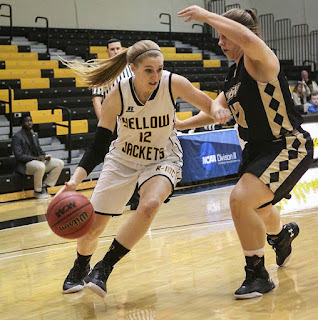 In women's basketball, Katie Anderson (pictured below, courtesy Nick Liberante) was named Most Outstanding Player of the R-MC Tip-Off Classic, scoring 17 points and grabbing 17 rebounds as Randolph-Macon held off Mount St. Vincent 72-67 Saturday evening at Crenshaw Gymnasium to move to 2-0. Lauren Vugteveen also had a double-double with 11 points and a matching 17 rebounds, while Hannah Livermon, named to the All-Classic Team with Anderson, led all scorers with 26 points. 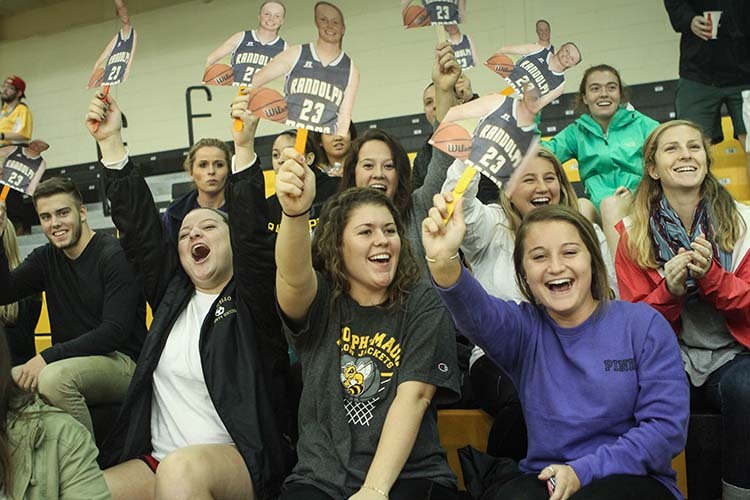 Randolph-Macon hosts Marymount on Tuesday at 6pm, and opens ODAC play at Washington & Lee on Tuesday, November 24th. 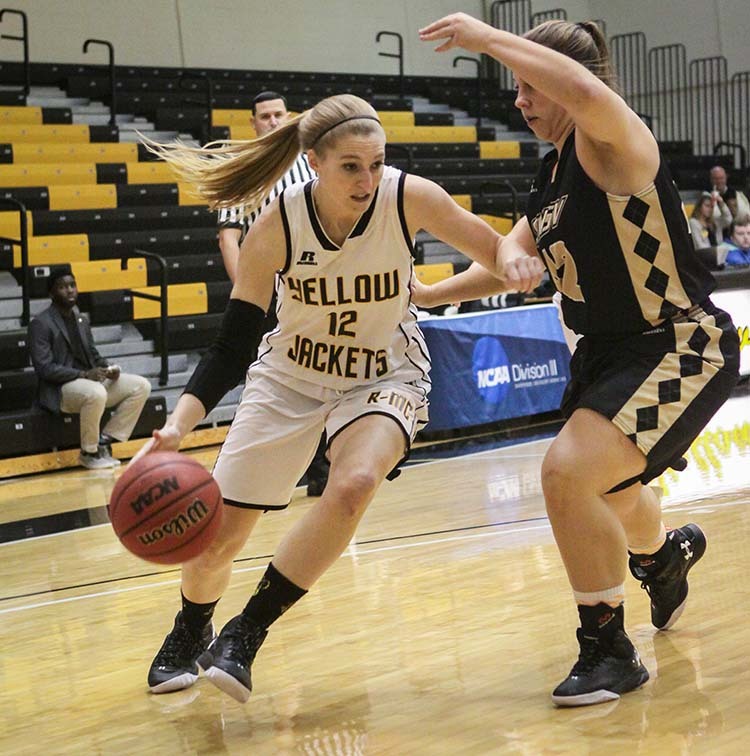 NOTE: Sunday at 2pm, Josh Merkel debuts as Randolph-Macon men's basketball coach as the Yellow Jackets open their season hosting Mary Washington. Congratulations to the following student-athletes for earning All-Conference 20 Volleyball honors! Those with (*) are also All-Academic where eligible. A frantic final 2:41 saw Atlee and Mountain View trade touchdown for touchdown, and, when the dust finally settled, it was Cole Blackman reaching high for a pass in the back right corner of the end zone, holding on, and getting a foot inbounds with 6.6 seconds to go give Atlee the 38-35 win in Stafford as the tenth-seeded Raiders eliminated the stunned seventh-seeded Wildcats in 5A North Region first round action Friday. The Raiders, now 7-4, move on to face #2 Tuscarora (11-0), last year's 5A North Region Champion, next Friday night. Meanwhile, Nathan Evans led an early Lee-Davis assault, as the Confederates built a 28-7 halftime lead en route to defeating Douglas Freeman 41-14 in 5A South Central first round play. With the win, Lee-Davis, now 9-2, gets a rematch with Highland Springs in second round action next Friday on the road. The Springers handed the Confederates their first loss of the year October 16th by a score of 42-0 in Mechanicsville. 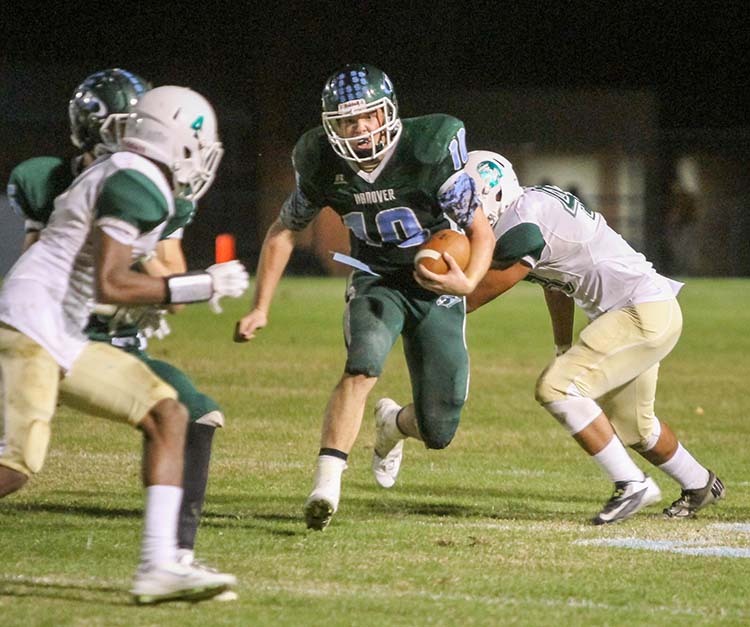 At Hanover, Clayton Cheatham accounted for six touchdowns as Hanover pulled away from Louisa for a 47-28 victory to set up a rematch with rival Dinwiddie in 4A East Region second round play next Friday. Hanover defeated Dinwiddie back on September 4th, and this will be the fifth time since 2008 the Generals and Hawks have met in postseason play. Cheatham was ejected from the game in the second half, and his status for next week's game is in doubt. We will update you on this stiuation as we get new information. RVA Sports Network will provide coverage for ALL three Hanover County teams as the first round of the VHSL football playoffs begins! This is our radio Game of The Week! Rob Witham will be live in Stafford to broadcast the Raiders in their first-ever 5A North Region postseason game on both WHAN Radio (102.9 FM/1430 AM) and online BY CLICKING HERE . Our coverage, as always, begins with the "On The Sidelines Pre-Game Show Powered By Sheehy Ford of Ashland" at 6:30, as Rob and Marc Davis of NBC12 will break down all the playoff action across the Central Region! RVASN is happy to partner with Evan and Kelly Hughes of "Patriot Talk Live", who join our broadcast team for postseason action! Evan and Kelly will provide live coverage of the Lions and Hawks Friday starting at 7:15pm. CLICK HERE to listen to this game! Our correspondent Taylor Luck, on Twitter at @TaylorRVASN, will be live at William E. Long Stadium to live tweet the Confederates as they battle the Rebels in first round action. Real-time Twitter updates will begin just before 7pm kickoff! iHeart Media (Fox Sports 910) selected this game for their Game of The Week broadcast, which is why WHAN/RVA Sports Network is unable to broadcast this game. If you would like to listen to their coverage, click here. Atlee and Patrick Henry move to Conference 12 for the postseason, beginning their quests for the 5A State Championship in tournament quarterfinal action on Monday in Chester. NOTE: Both championship match participants clinch berths in 5A South Region Tournament the week of November 9th. A) Lee-Davis takes fourth in 5A South Central, but only by a quarter point over 8-0 Douglas Freeman. The Confederates are being rewarded for playing a tougher schedule (Capital District) versus the Rebels (Colonial District). Lurking two points below Lee-Davis in sixth is their opponent Friday when they travel to #6 Henrico (in a game you'll hear live on our "Game of The Week"). If Lee-Davis wins out, they could, repeat, could, host a first-round playoff game. But if they win out and Douglas Freeman upsets Hermitage on November 6th, Lee-Davis could find themselves the fifth seed, and on the road in round one on November 13th. B) Atlee solidifies position in 5A North, while Patrick Henry falls further behind. The Raiders now hold 13th place alone after being tied for it a week ago before their home win over the Patriots, who drop from 17th to 18th place in a region where the top sixteen teams make the postseason. Atlee is over two and a half points ahead of the 17th seed, Potomac, but a loss to Varina Friday, coupled with a Potomac upset of #3 seed Brooke Point could all but erase their 21-point lead, and bring Atlee back towards the cut line. Wins over Varina and Armstrong all but assures Atlee a postseason berth. The Patriots can easily vault into the top sixteen if they win their final two games, but that's a huge "if". They must try to stop the Highland Springs express Friday at home on Senior Night, then they must travel to Lee-Davis for the 57th Tomato Bowl November 6th (to be heard live on our "Game of The Week"). Two wins, and Patrick Henry is in. One win, and it depends on the fate of other teams like Halifax, Potomac, George Marshall and Patrick Henry-Roanoke. The Patriots likely must win once if they want to play on November 13th. C) Hanover stays right where they were in 4A West in the Conference 19/20 subregion, despite their loss to Lee-Davis Friday. The Hawks are second, three-quarters of a point behind top-seeded Courtland, who were upset by #8 seed King George. Monacan is just behind the Hawks in 3rd, but just have one game left, this Friday hosting Manchester. One point behind Hanover in a tie for fifth are Chancellor and Eastern View. The Hawks go to Armstrong Friday, then host Henrico to finish the regular season. Two wins should give Hanover that second seed they now own, unless Courtland loses their final two games, highly unlikely since they close at hapless Caroline. But a loss in the next two weeks, depending on results from the other teams noted, could put the Hawks anywhere from second to fifth. A fifth place finish means a road trip November 13th, while a second place finish assures them of two home games to start the postseason. To see the complete VHSL standings, visit our main network website by CLICKING HERE! *--If Atlee wins Tuesday, they host as top seed. Only way Patrick Henry can host is if they beat Albemarle and Orange beats Atlee. NOTE: Semifinal winners currently scheduled to clinch berths in the 5A North Region Tournament. #10 Lee-Davis 20, #9 Hanover 12: The Confederates' defense bends, but never breaks, holding the Hawks to four field goals as Nathan Evans scores with 54 seconds left to turn a one-point lead into an eight-point win. Lee-Davis is 7-1, Hanover falls to 5-3. Atlee 34, Patrick Henry 20: AJ Zollar has two touchdown runs, including a 79-yarder, while Rasharrd Harris threw two touchdown passes as the Raiders pulled away from the Patriots in the second half. Both teams are now 4-4. Lee-Davis: Now 7-1, could move ahead of their next opponent, Henrico, in the 5A South Central subregion standings when released Monday. Have outside chance at the #4 seed, which would mean a home game in round one. Plenty to play for. Hanover: Now 5-3, lost a golden opportunity to become #1 seed in their eight-team subregion (Conferences 19/20) when King George upset top-seeded Courtland. Hawks must again regroup, head to Armstrong, then finish at home with Henrico. Hanover is 1-3, though, in front of the home crowd, 4-0 on the road. Still in good shape for postseason. Atlee: Now 4-4, much-needed win, trying to move higher than 13th in 5A North. Could be 12th when new standings release. Host Varina, then at Armstrong, the easier part of Capital District schedule, but both teams will be desperate for a win for their own playoff hopes. That's dangerous. Patrick Henry: Now 4-4, started tonight 17th, 1/10th of a point out of the playoffs. #16 Briar Woods won, as did #18 Halifax. The Patriots may drop to 18th. They must win one of last two to be in the playoff conversation, really need both to solidly earn a postseason bid in 5A North. As we feared in August, the 2015 Patriots could be better than the 2014 Patriots, but the new Capital District, rather than Colonial District schedule, could end up producing a worse record (Patriots went 6-4 in regular season a year ago). CLICK HERE to listen live to the Patriots and Raiders fight for a playoff berth in 5A North starting at 6:30 with the On The Sidelines Pre-Game Show Powered By Sheehy Ford of Ashland with Rob Witham and NBC12 Sports Director Marc Davis! NOTE: The game is heard locally on WHAN Radio, 102.9 FM and 1430 AM! We also will have LIVE updates from RVA Sports Network Correspondent Taylor Luck from the Lee-Davis/Hanover game on air and on Twitter all evening long! Follow us at @hanoversports and at @TaylorRVASN ! Glen Allen 2, Patrick Henry 1 (OT; Jaguars win 2-1 in shootout): Aidan Rossman had the regulation goal and penalty shot in shootout. Patriots finish 6-7, will travel to Albemarle in Conference 16 Tournament semifinals on Tuesday at 6pm. The Hanover Hawks are the #3 seed in the Conference 20 Tournament which begins Monday. Hanover will face #2 Powhatan in one semifinal at 7pm on Field #4 at River City SportsPlex in Chesterfield, while top-seeded Midlothian faces #4 Monacan in the 5:30pm semifinal. Winners clinch berths in the 4A East Region Tournament and play for the Conference 20 Championship on Tuesday at 6pm, also at River City. Atlee celebrated Senior Night on Wednesday with a three-set sweep of Armstrong to improve to 19-2 on the season. The Raiders, top-ranked in the RVA Sports Network Super 6 Boys Volleyball Poll, knocked off fourth-ranked Mills Godwin Monday in four sets. Tuesday saw the Atlee Raiders boys volleyball team, currently the top seeded team in the Super 6 Poll, take on their county rival Patrick Henry Patriots in what may well be a preview of a first round match in the Conference 12 tournament. Patriots came into the night with a 13-6 record, and planned on using the game as a measuring stick to see how far they had progressed over the season. But the Raiders wanted to show why they've earned their top ranking, bringing a dominating performance in all aspects of the game for a 3-0 victory over the Patriots. Atlee jumped out to a 5-0 lead early in set 1 and only increased that lead before taking the set, and the 1-0 match lead, 25-16. The first 10 points of set 2 were close, but Atlee rallied for another 25-16 win after being tied 9-9 earlier in the set. Set 3 was never close, as Atlee gained a 5-2 advantage early on and never looked back. Patrick Henry made a last ditch effort to come back with their backs against the wall down 24-15, but their 4 point rally wouldn’t be close to enough as Atlee finished their dominating sweep with a 25-20 set 3 victory. Patrick Henry had no answer to Atlee's control of the net, including powerful kills from Eric Rohr and Jake French. Rohr led the way for Atlee, with 11 kills on the night. Owen Ward totaled 33 assists and Jacob Rehmer-Stephens had 18 digs against the Patriots. The Raiders finish their regular season away Tuesday against Henrico. Patrick Henry is now 13-7, and is trying to earn as high a seed as possible in the upcoming Conference 12 Tournament. The Patriots came into tonight without senior Dalton Nash, and lost senior Austin Spencer to what appeared to be an ankle injury after the second set. With injuries spreading them thin, and familiar issues of letting close balls go and poor serving plaguing the team; Patrick Henry faces an uphill battle as the postseason draws near. The Patriots finish off their season with a final home game on Thursday against Highland Springs, and two away games next Tuesday and next Wednesday against Varina and Armstrong. A 3-0 record in the final stretch should help the Patriots boost their seeding for the following week's tournament. Atlee and Patrick Henry join Conference 12 for the postseason because no other team in their regular conference, Conference 16, plays boys volleyball. The tournament brackets are available on our sister website by CLICKING HERE. Updated VHSL playoff standings released Tuesday morning have placed Briar Woods ahead of Patrick Henry into the 16th and final playoff berth in the 5A North Region. Briar Woods (2-6) is at 22.375 points, with the Patriots (4-3) at 22.143. Patrick Henry does have a game in hand, with three left to play, while the Falcons have two, against Chantilly and Stone Bridge. Patrick Henry goes to Atlee, currently tied for 13th in 5A North, this Friday in a game that can be heard LIVE on the Game of The Week on WHAN Radio, 102.9 FM and online by CLICKING HERE! NOTE: To see ALL area VHSL Playoff Standings, CLICK HERE!